Please click on the image and refer to the image metadata page for copyright and licensing information. 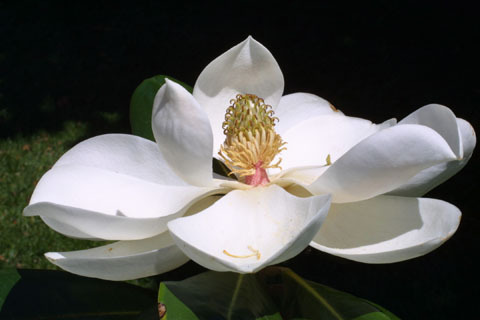 The magnolia family (Magnoliaceae) is considered by taxonomists to be one of the least derived angiosperm families. 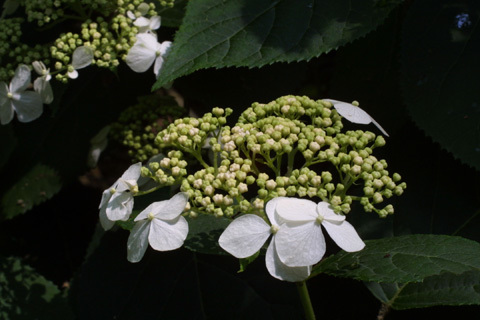 The flowers are relatively simple with parts arranged in whorls and having a somewhat leaf-like appearance. There are no specialized morphological adaptations to exploit pollinators. Insects simply crawl around on the flowers looking for the nectar reward and become dusted by pollen if they crawl over the strap-like anthers. Relatively unintelligent insects like beetles can potentially act as pollinators of this group. 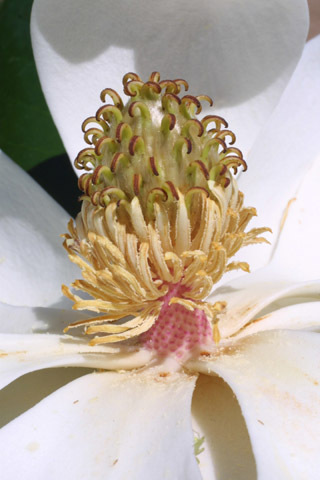 Magnolia grandiflora (southern magnolia) - the whorl-like arrangement of parts is apparent in this image. 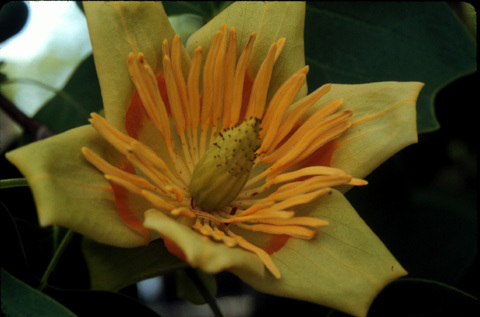 Liriodendron tulipifera (tulip-tree) - insects can walk over the anthers in this simple flower. 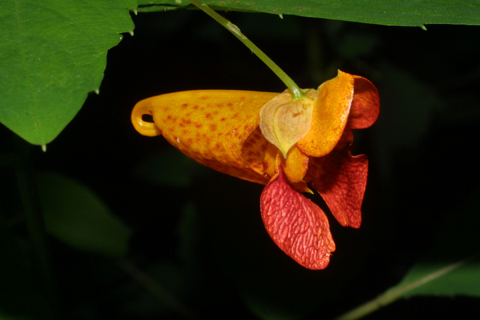 In general, wind-pollinated flowers are green, small, and often lack petals. The anthers and stigmas generally hang outside the flowers to allow the wind to carry the pollen. 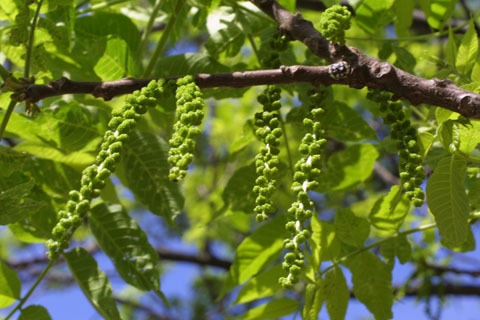 Juglans nigra (black walnut) - Male flowers are arranged in catkins which hang down to be blown by the wind. 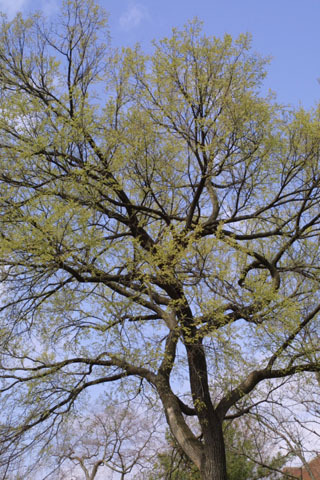 Juglans nigra (black walnut) - Female flowers are green, with no petals or sepals to attract pollinators. The stigmas are relatively large to catch pollen. 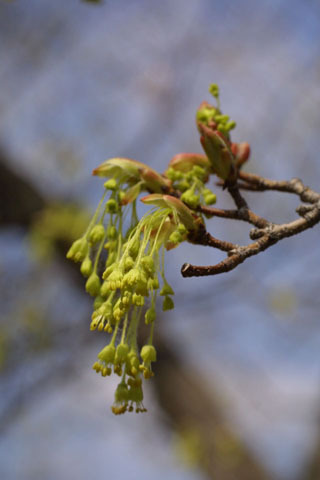 Acer saccharum (sugar maple) - The anthers as well as the flower itself hang down where they can be blown by the wind. The flower has no petals. 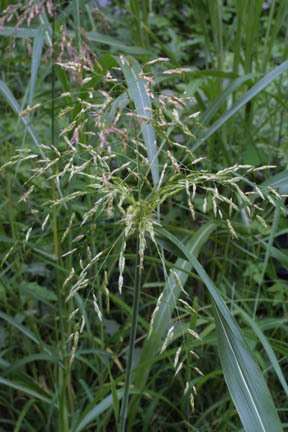 The flowers of grasses are located at the top of the plant where they are exposed to the wind. 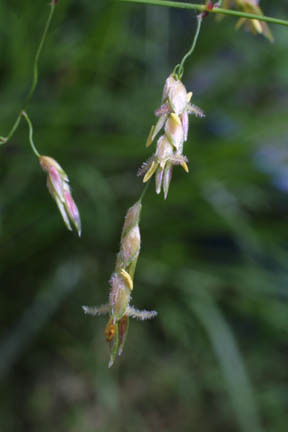 The anthers and feathery stigmas of grasses hang out of the flowers where they can be blown by the wind. Petals are absent. As insects, bees are relatively intelligent and are able to learn how to locate and operate particular species of flowers that are in bloom at a particular time. 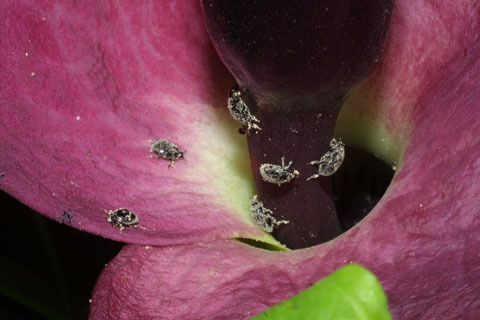 They are also relatively strong and are able to push their way into complicated flowers that are not accessible to other insects. 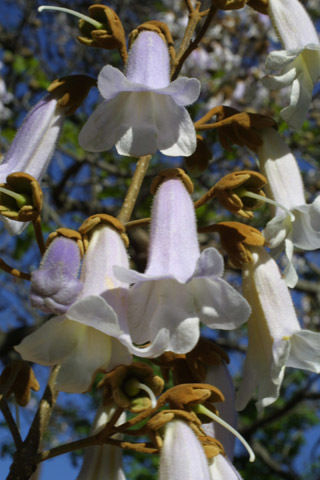 Paulownia tomentosa (princess-tree) - bee vision is most sensitive toward the violet end of the spectrum. So bee-pollinated flowers tend to have blue or violet markings. Some may even have markings that are only apparent in the UV range. Paulownia tomentosa (princess-tree) - bee-pollinated flowers often have a lobe that serves as a landing pad. 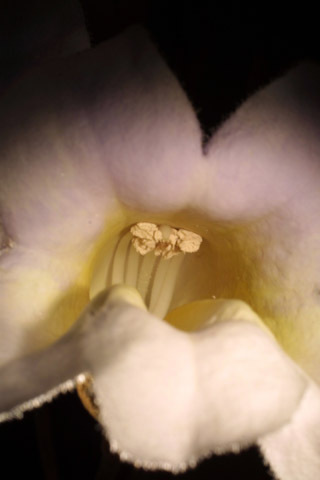 Anthers often are located at the top of tubular petals, dusting the back of the bee as it enters. Catalpa speciosa (northern catalpa) - a broad "landing pad" is present. Plants employ a number of methods to make their flowers more noticeable to pollinators. All members of the large and successful Asteraceae (sunflower) family have composite inflorescences containing many flowers arranged to draw attention to the display. 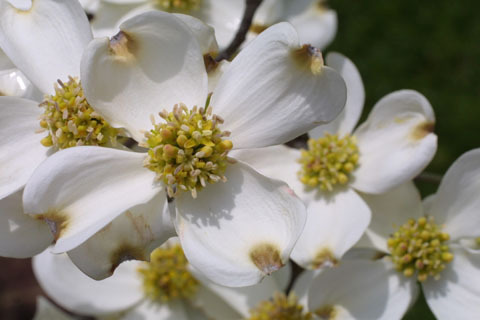 Cornus florida (flowering dogwood) - The "petals" of the dogwood inflorescence are not actually a part of the flower. 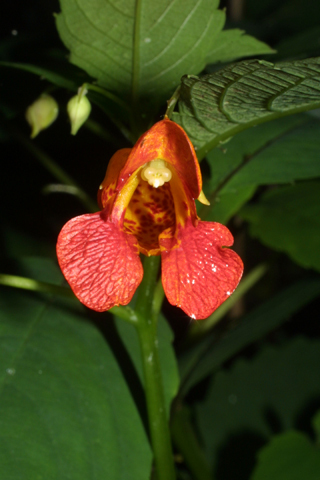 They are showy bracts (modified leaves). The actual flowers are the small and yellow structures in the center of the display. 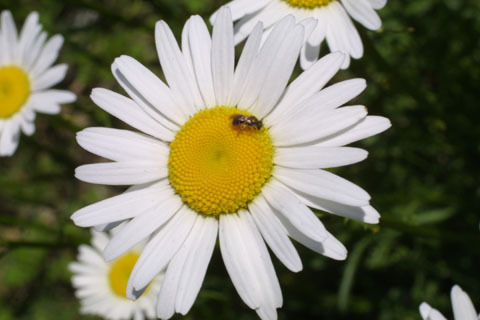 Leucanthemum vulgare (oxeye daisy) - The "petals" of members of the Asteraceae family are actually "ray flowers", modified flowers that are large and bent back to draw attention to the center of the flower. The "disk flowers" in the center are fertile. 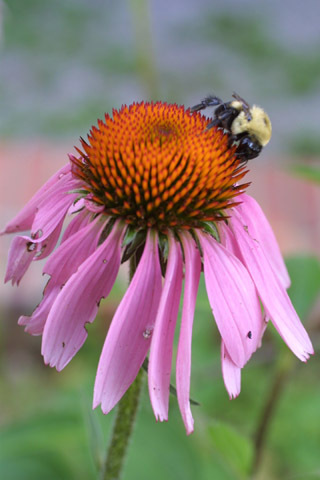 Echinacea purpurea (eastern purple coneflower) - another member of the Asteraceae family with disc and ray flowers. As insects crawl over the disk searching for the reward, they move pollen between flowers. 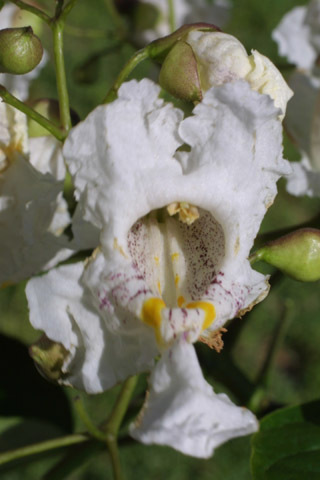 Some flowers produce a bad smell and have a purplish color to simulate the rotting flesh of dead amimals. These flowers attract beetles and carrion flies who pollinate the plant as they are fooled into trying to lay eggs on the flower. 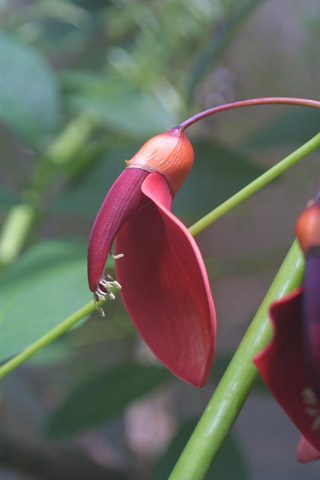 This group includes the Araceae family, which produces highly modified flowers. 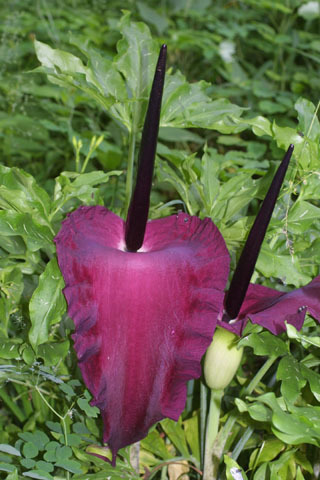 Dracunculus vulgaris - The "flower" consists of a purple leafy bract ("spathe") that wraps around the inflorescence. 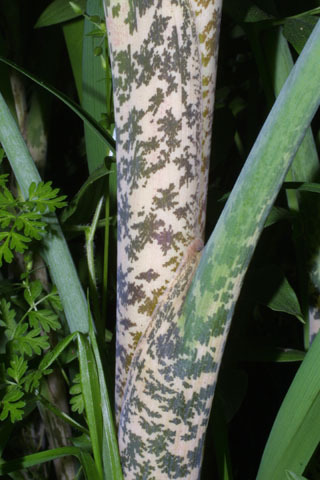 Dracunculus vulgaris - The stem has the mottled appearance of rotting flesh. 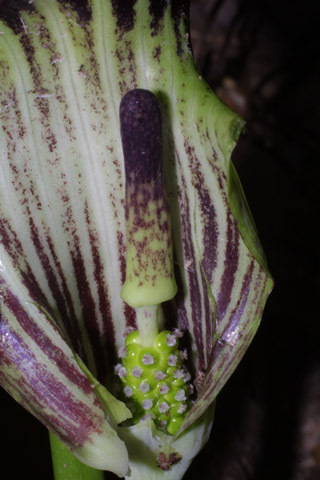 Dracunculus vulgaris - The fruit develops from the flowers at the base of the spadix. 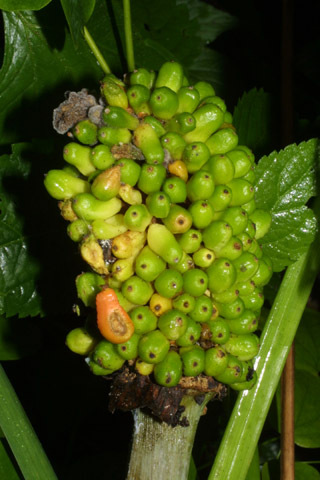 Eventually, the spathe and top of the spadix fall off. 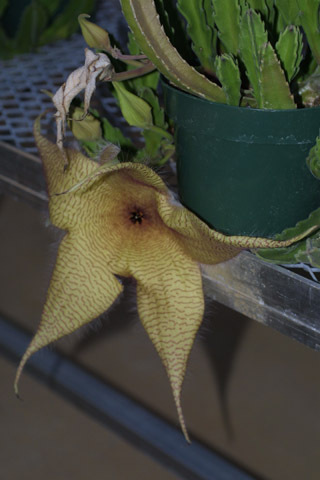 Stapelia gigantea (carrion flower) looks like a cactus, but is actually in the milkweed family (Asclepiadaceae). 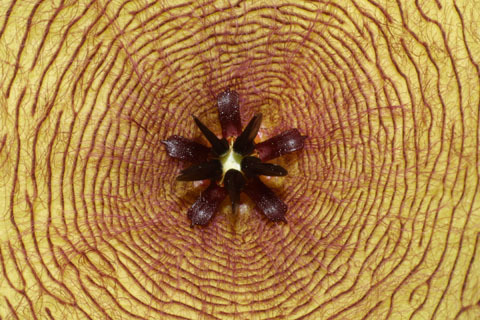 Stapelia gigantea - The flower's carrion smell attracts flies which may lay eggs on the flower. Sometimes fly larvae that have hatched from the eggs can be seen on the flower. 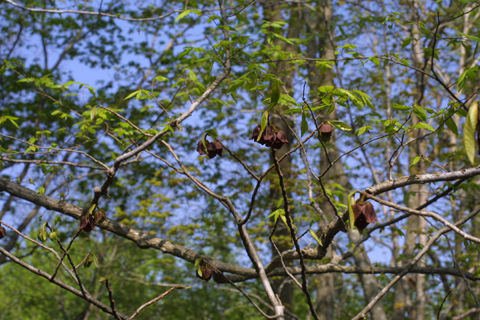 Asimina triloba - Its malodorous flowers attract carrion insects. 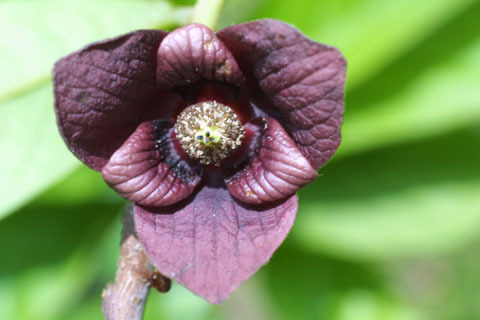 Asimina triloba - Front view of flower. 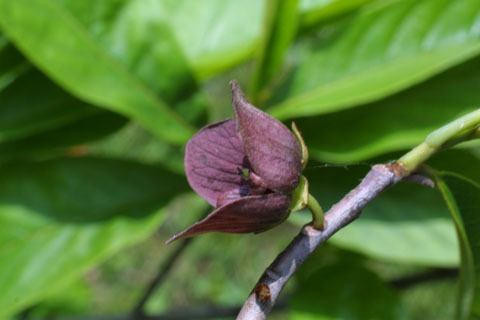 Asimina triloba - Although paw-paws commonly flower, fruit set is relatively rare. 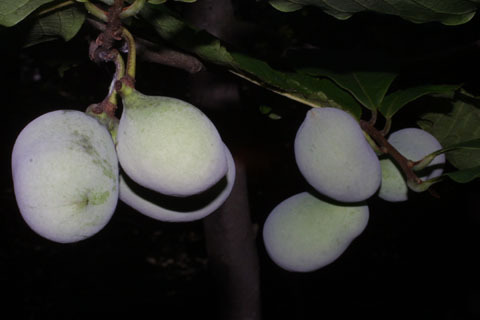 However, commercial growers increase fruit set by hanging dead fish or road kill in the trees to attract carrion flies. 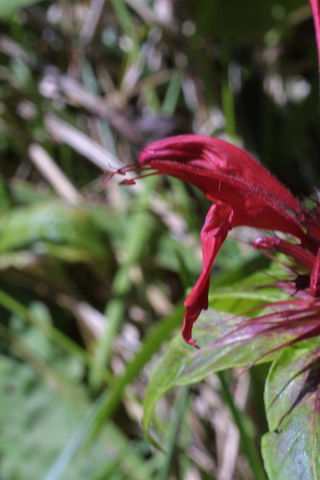 Many hummingbird pollinated flowers are red, a color to which bird eyes are sensitive, but which is not as apparent to insects. The hummingbird must hover and reach deep inside the flower to reach the reward. Different species of flower may dust the bird at different locations on its body so that its pollen will be more likely to end up on another species of the same kind. These flowers usually do not have a strong odor because the hummingbirds do not have a particularly well-developed sense of smell. the hummingbird as it drinks. hummingbird which can hover while drinking. 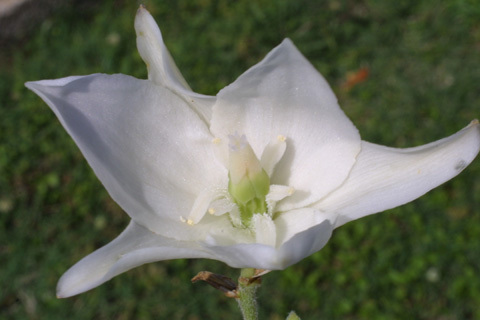 Moth-pollinated flowers are usually white and have a strong scent. These features allow moths that are active at night to find the flowers. 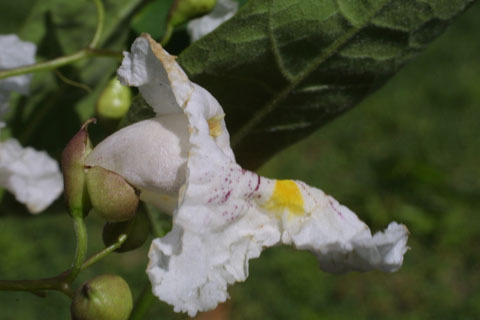 pollinated at night, attractive colors would provide little benefit. 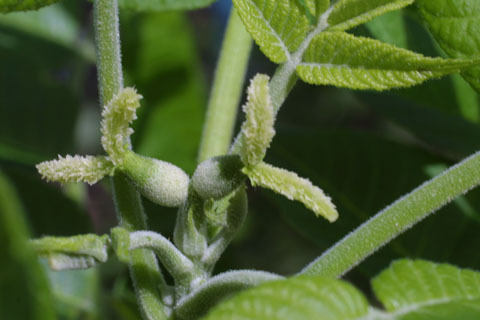 too many eggs on a flower, the flower will abort and drop off the plant, selecting against individuals that overexploit the plant. 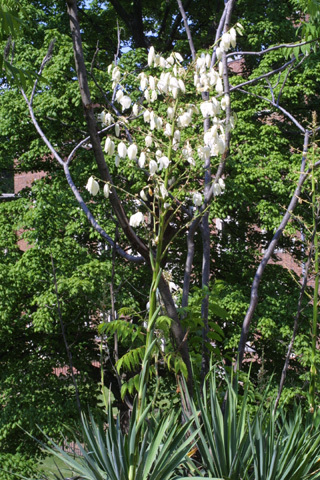 The yucca-yucca moth system is one of the clearest examples of coevolution between plants and animals.